During Navarathri different kinds of sundal and sweets are prepared and being shared with family and friends. Today I have prepared Pasi Paruppu Payasam and Red Kidney Bean/ Rajma Sundal. Its also called Payatham Paruppu, Siruparuppu in Tamil, Pesara Pappu in Telugu, Moong Dal in Hindi and Hesaru Bele in Kannada. 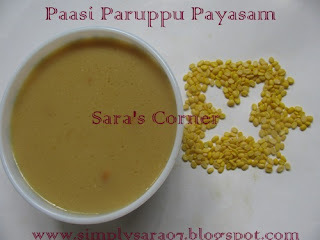 Pasi paruppu is very cooling and good for mouth ulcers. Pressure cook the Pasi paruppu with water for 3-4 whistles. In a vessel put vellam/jaggery with 1/2 glass of water and allow it to dissolve. Keep stirring. If you find any mud particles then you filter it and boil again till the raw smell goes in low flame. Then add milk and mix well. Allow it to boil for 5 mins. Now add the steamed pasi paruppu and mix well. In a separate pan, heat ghee and add nuts. Once its brown garnish it. Pasi Paruppu Payasam is ready to serve. Serve hot or cold. Droolworthy payasam, looks simply delicious.. I lov epayasom like this and this just looks so so yumm. Healthy and delicious payasam, looks very yummy. Looks yummy payasam..Thx for your healthy tip on ulcer.. Healthy payasam. Amma used to make it lot. My hubby's favt! Looks perfect! happy festival payasam looks yum.. Simple and favourite... Gonna try this today..